At this moment I would like to introduce my family to you. As any one would want it to be, I have a family where there is lot of support and understanding between its members. My father, Mr. P.J. 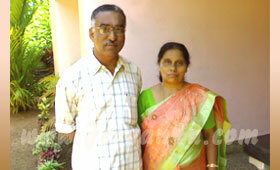 Augustine is a businessman and and my mother, Mrs. Alamma Augustine spent the major part of her life as a teacher at St. Mary's Girls High School Kanjirappally and is now leading a retired life after successful completion of her tenure. My father is from Kallumkamakkal family at Pala and my mother is from Naduvathani family at Koovappally, near Kanjirappally. My only sister Swapna K Augustine M.A., B.Ed is married and well-settled. I'm married to Tintu, daughter of Mr. AC Joseph and Mrs. Mariamma Joseph. Tintu hails from the famous family 'Azhakkathu' in Kanjirappally. I was born and brought up at Kanjirapally in Kottayam district Kerala India. My father has 6 sisters and 2 brothers. One of his brothers is a priest 'Rev. Fr. Joseph Kallumkamakkal' is now in Germany for the past 8 years. My mother has one sister 'Sr. Shobana Naduvanthanyil' who is a nun, and 3 brothers who are now working abroad.